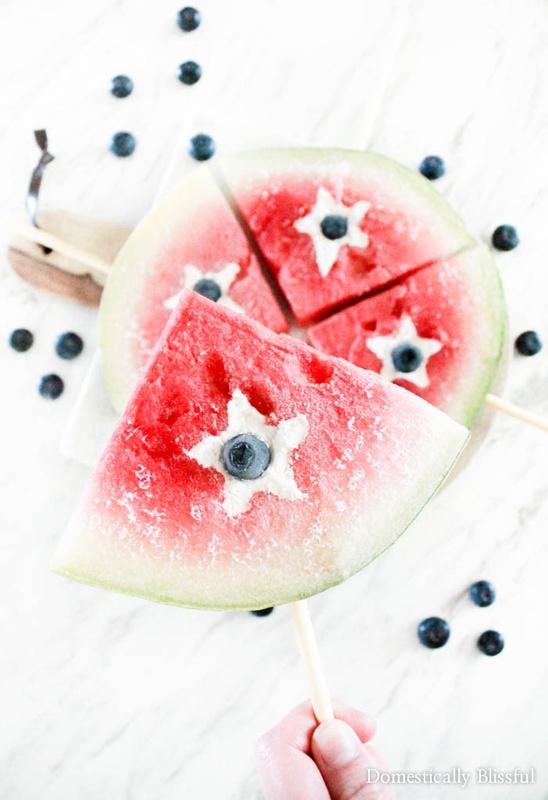 Frozen Patriotic Watermelon Pops are filled with whipped coconut cream & a blueberry to create the perfect summer treat for any red, white, & blue occasion. A few weekends ago we traveled to D.C. for a quick little weekend trip to the Capitol. There is nothing like visiting the political heart of America to make you feel extra patriotic. Throughout our trip we passed by so many people of different nationalities I couldn’t help but feel at home in the melting pot of America. The day my father became a United States citizen was a really exciting day for me & for our whole family. And celebrating the independence of America & the freedom granted to us by so many in the past & present is a beautiful tradition. 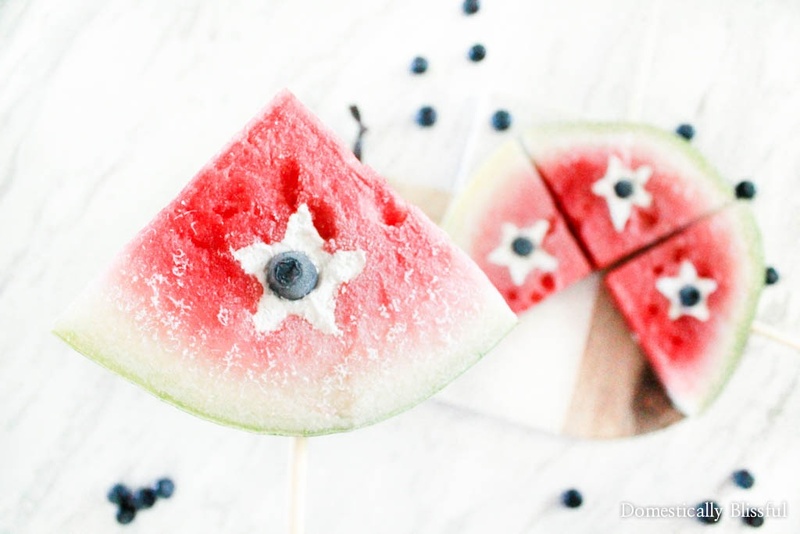 So while brainstorming 4 new watermelon recipes with Roger we came up with these Frozen Patriotic Watermelon Pops. I’ve made frozen watermelon before, to use as ice cubes, which you can see here, but this year I decided I wanted to take it a step further. Like most recipe brainstorming sessions with my husband, we bounce around a million different ideas at once & they slowly transform into 1 or 2 recipes based off of a variety of our original ideas. Our last food discussion based around watermelon resulted in the creation of 4 new watermelon recipe ideas. And if you are following me on Instagram you might have seen my InstaStories showing you my beautiful new kitchen destroyed by food & dishes strewn everywhere. In one day I was able to create 2 & 1/2 recipes. And hopefully, by the time you are reading this, I will be in the midst of completing the last 1 & 1/2 recipes. And as for today, I am sharing my first watermelon recipe of the summer season. 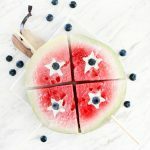 As this is not my first time freezing watermelon I knew these Frozen Patriotic Watermelon Pops were going to be quick, easy, & perfect for summer, & especially 4th of July. 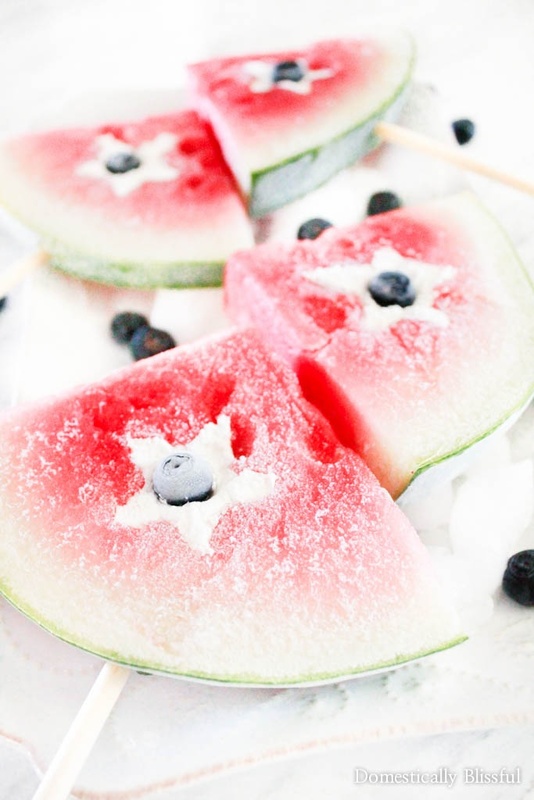 Who doesn’t love watermelon, coconut, & blueberries? 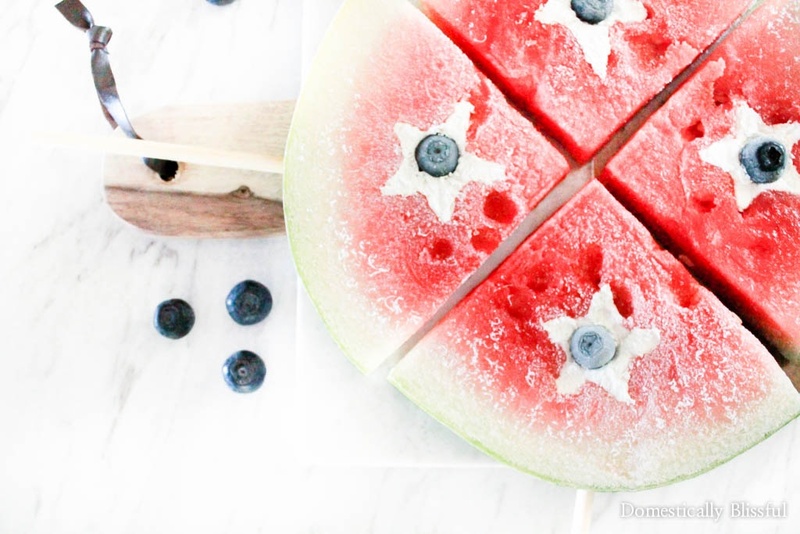 As I was writing this I realized that this isn’t my first independence day recipe feature watermelon, coconut, & blueberries. 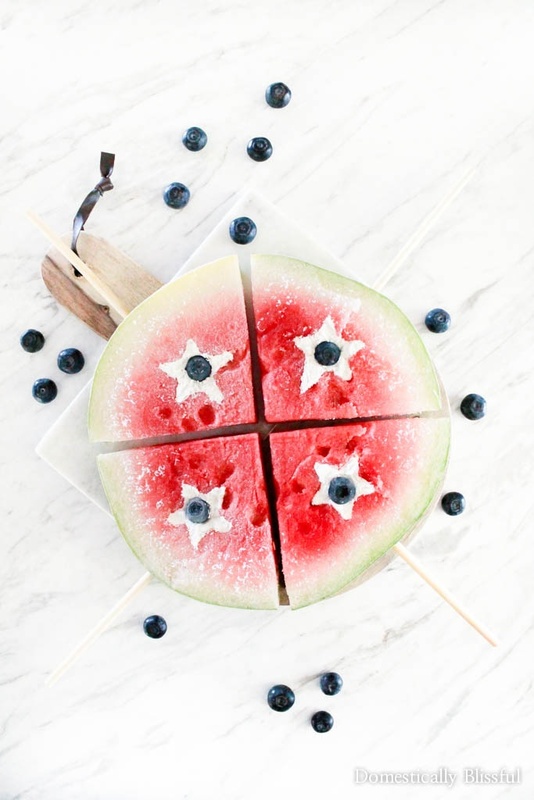 Somehow I completely forgot about these Patriotic Fruit Skewers! And if you are looking for more watermelon recipes, be sure to check out all of my watermelon posts by clicking here, which includes recipes like Watermelon Cupcakes, Watermelon Fruit Leathers, & much more! 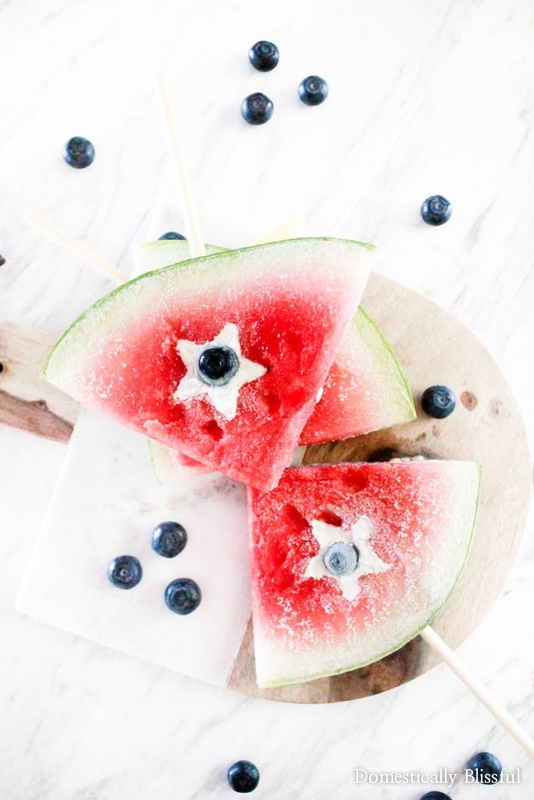 First, cut out a star in the center of each triangle watermelon slice & insert a popsicle stick through the rind & into the watermelon, using a knife to cut the slit in the watermelon. 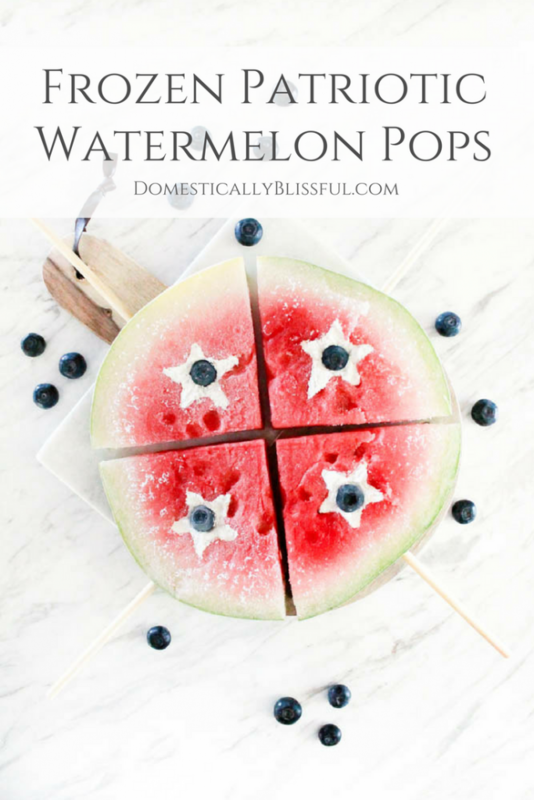 Then set the watermelon pops on baking sheet lined with wax paper. Continue this process until all of the watermelon slices are filled & topped. *2. If the whipped coconut cream is too thick add 1/4 teaspoon of the remaining coconut milk & continue blending. Add more as needed. *3. If need be, add a little bit of coconut cream to the base of the star half way through the chilling process so that the stick isn’t visible. Did you enjoy your Frozen Watermelon Pops?